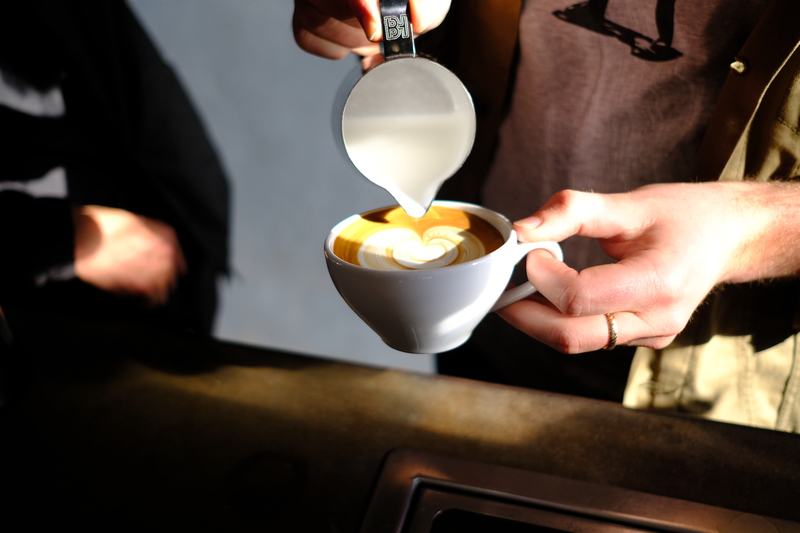 Head trainer Hugh gives us the full run-down on creating & using blends – part art, part science & how the precision all comes together for a delicious milk coffee. What is the purpose of providing recipes for each blend? Recipes give us a starting point for each of the blends, providing a guide to get the best flavour from each individual coffee. The recipes are part art, part science. They’re aiming to highlight each of the blends’ personalities as well as facilitate the best extraction. Why don’t you recommended recipes change all the time? Great question! Many cafes will choose to alter their recipes day to day, seeking to find the best expression for the particular coffee(s) they’re running. The recipe we provide is designed to give the best flavour, most of the time. You’ll notice each of the single origins we sell has an individual recipe, as do each of the blends. As to whether you choose to tweak these specs or leave them as is, that’s up to you. If you’d like to learn more about when/how to change your recipes, please book in a training session with our Customer Love team! What factors might prompt me to change my recipe? Coffee Age: Your coffee will change as it gets ‘older’ or further from roast. Fresher coffee is typically harder to extract flavour from and will tend to be more acidic. Older coffee tends to be easier to draw flavour from, but risks being flat or dull. Aiming to serve the coffee in the same age bracket through good ordering is the best solution to this problem, but sometimes a wildcard week will catch you by surprise and force you to use coffee outside of its optimum age. Fresher coffee will generally taste best at a lower dose or longer yield, and older coffee will taste best with slightly higher doses or shorter yields. Equipment: We write our recipes based off a La Marzocco PB, Mythos, EK (for single origins!) and 20g VST baskets. For our blends, we also check our specs on a range of other equipment to make sure the coffee is singing. While we do our best to provide recipes that will be tasty across a range of equipment, differing machinery, grinders or baskets may require a recipe tweak. Water: Ah, the unsung hero of tasty coffee. Water makes up around 90% of your espresso, and roughly 98.7% of your filter coffee. Differences in the mineral composition in the water will change how the compounds of your coffee dissolve and thus influence extraction & flavour. While all of us have a water filter on our espresso machines to pull out the harmful stuff, regional water differences can still affect extraction, and you may find you see a trend in preferencing ratios longer or shorter than our recommendation. How much do brew recipes change from blend to blend and why? As mentioned above, the recipes are designed to bring out the individual characteristics of each blend. Reservoir, our vibrant fruity guy, runs a longer brew ratio to accentuate the fruit, draw out the sweetness and balance the acidity. On the other end of the spectrum is Yeehah – a gutsy, delicious homage to the more traditional Italian style of blending and roasting. This coffee is much more about texture, deeper sweetness & darker notes, and has a recipe with a lower brew ratio that’s designed to highlight these characteristics. Solubility also comes into play when deciding on brew recipes, as we’re aiming to dissolve the correct amount of dry coffee into the espresso shot. Each of our recipes are positioned to enhance the tastiest parts of each blend, representing each flavour profile as best we can. How does the concept of solubility influence the way you write recipes? Solubility as a concept relates to how easy or difficult it is to dissolve a solute (coffee) into a solvent (water). An item with higher solubility is easier to dissolve, and vice versa. When it comes to discussing a coffee’s solubility, we have to consider the green coffee as well as the roasting process, with different combinations producing coffees that are either easier or harder to dissolve. When talking about espresso your ability to dissolve flavour may also be affected by technique as well as how the equipment is set up. For us, we’re aiming to remove inconsistency as much as possible & focus on techniques and equipment set-ups that maximise potential solubility, helping us get the most out of our coffees. All this is to say – the recipes that we publish are about bringing out flavour & balancing strength against the need to find the correct extraction, which is informed by solubility. Fairly complex, huh? Thanks, guys! Enough science talk for now. If you made it this far, go get yourself a ‘spro!